I've been heaping praise on 'Tomboy' for a long time. It's so expertly executed and genuinely compelling that it's become one of the best titles in comics. This latest issue only solidifies what I've known over the last seven issues - 'Tomboy' is a masterfully crafted story of dark girl magic, vengeance, and corruption. Mia Goodwin mixes different elements in her storytelling and it's seamless. Take this opening sequence where Irene Trent is being questioned in a police station for instance. I've seen a lot of Law and Order episodes so I know good interrogation scenes. The banter between the detective and Trent's lawyer is a delicate dance, one is probing for a hint of guilt, the other is deflecting, seeming incredulous to the insinuations. Goodwin devises a very clever scene that turns the narrative of the story to the police procedural aspect of 'Tomboy' and it's as riveting as the longtime TV drama. Suspicion of Trent is finally getting some traction with a smart determined detective at the helm. She gets some more insight, accidently, from Henri as he goes through the timeline of events. It's also a good recap for new readers to catch up with what's happened so far, tracking who's died along the way. The use of Henri talking to himself out loud works brilliantly in several ways. The transition to Jessica's wake reminds us of the horrors that have befallen the town and the pain that stirs in Addison. Her scenes are especially poignant. She is seething at the loss of her friend, who happens to be in attendance in spirit. But it's her interaction with Jessica's boyfriend that reveals more. Addison sheds her defenses for a minute, trading curtness for humility, so she can reconcile with him and grieve together. It's one of the best scenes in the series so far. Goodwin isn't afraid to expose the raw emotions of her characters. It would be have been easy to just depend on the violent nature of a monstrous supernatural vigilante like Addison, creating a gratuitous series of bloody encounters, but Goodwin respects her characters and audience too much to make them one-dimensional. Michelle Wong does amazing work laying out the story, capturing every suspicious look, feign surprise, solemn demeanor, reflective stare, and body language that speaks volumes. Wong conveys every emotion in some way perfectly but can do a pretty impressive slaughter scene equally as well. The subtle color palette Wong uses leaves a melancholy cloud over most of the issue until a burst of red cuts through like a bolt of lightning. Goodwin and Wong work great together, keeping each other sharp to tell a fantastic story. I don't know how well 'Tomboy' sells but I'm sure it isn't enough. In some ways, I want to keep this comic to myself and savor the joy of an indie book that isn't part of some great big conglomerate but mine alone. 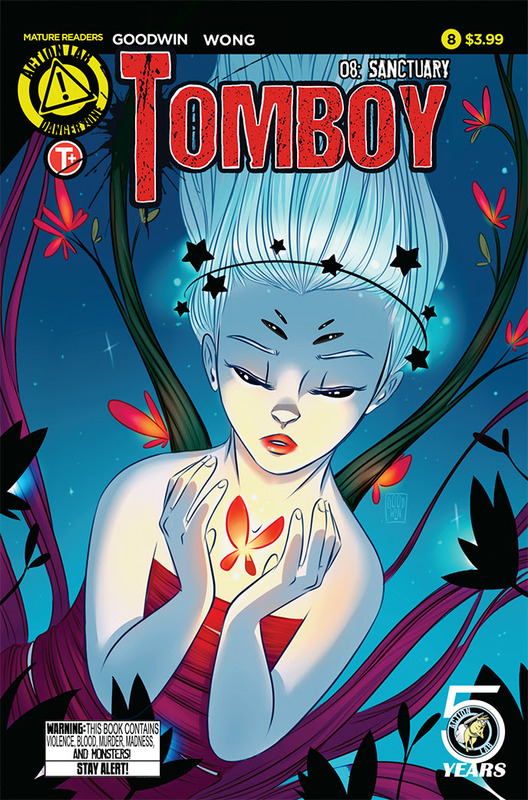 However, no matter how selfish I may be 'Tomboy' deserves to sell out each month requiring second and third printings. It's that good. It's smart, immersive, disturbing, and uniquely original.